If you are getting ready for presentations, creating branding identity for company, shop or agency, or just looking for professional Balloon mockup, this one will be great exactly for you! This mockup is professional PSD file that can be easily customize in Photoshop. After downloading our freebie, you can get the 4000 x 3200 px PSD mockup with smart and separate object and very high detalization. This is high quality mockup PSD fully layered and grouped. It allows you to display your design easily and quickly, sale a lot of time and get some awesome results in future. You can add there the necessary design, create presentations, print it or send to your clients via email. We hope our work can help you in implementing your aims and professional ideas. Choose from many different themed and multipurpose PSD Mockups on our website and use them for your private and commercial needs. Unique and stylish PSD mockup can be very useful for designers, artists and promoters. 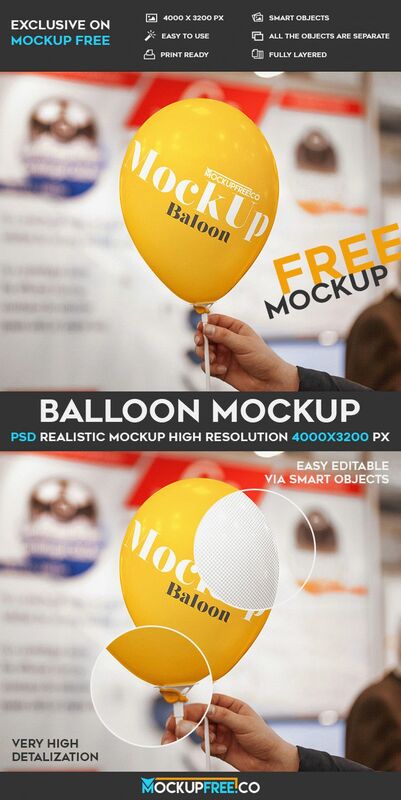 Download it absolutely free from Mockupfree and enjoy this mockup!